Taiwan is building a wharf on Taiping Island in the disputed Spratly Archipelago to increase its naval presence. Taiwan has announced it will invest 3.37 billion New Taiwan Dollars (US$106.5 million) over three years to build a wharf on Taiping Island in the disputed Spratly Archipelago to increase its naval presence in the area, a move that is likely to irritate other claimants to the region. According to Lin Yu-fang, a legislator from the Kuomintang (KMT) who sits on the Foreign Affairs and National Defense Committee, 1 billion NTD (US$33.6 million) is to be set aside for the project during FY 2014. The budget is expected to be passed by the Legislative Yuan when it reconvenes later this month. Work on the wharf is to be carried out by the National Expressway Engineering Bureau under the Ministry of Transportation and Communications. Located some 1,600 km from Kaohsiung in southern Taiwan, Taiping (also known as Itu Aba), is the largest of the Spratly Islands and the only one with fresh water in the area. It features a 1,150 m Taiwanese runway, which was completed in 2008 under the Democratic Progressive Party (DPP) administration, and a small wharf that can accommodate vessels with a displacement of no more than 6 tons. The new wharf will be able to accommodate heavier vessels from the Coast Guard Administration (CGA), which is currently in charge of protecting Taiwan’s claims to the island, as well as Navy ships if necessary. Completion of the wharf will also facilitate the unloading of heavy equipment that will be necessary for Taiwan to move forward with its plan to extend the runway, which currently can only accommodate partially loaded Hercules C-130H transport aircraft in “extremely good” weather conditions, said Lin, a strong proponent of greater defenses for the island. Currently, Taipei has plans to extend the runaway to about 1,500 m.
Taiwan has already begun trying to minimize the impact the plans for the new wharf will have on its relations with other countries that claim the Spartley Islands. While the nation’s sovereignty over the island cannot be compromised, Taiwan’s representative to Australia, Katharine Chang, told Radio Australia on Monday, Taiwan was willing to promote a spirit of “joint development” in the region. The move occurs as Manila accused the People’s Republic of China (PRC) on Tuesday of violating the Code of Conduct in the South China Sea by readying to build new structures in the disputed Scarborough Shoal (known as the Panatag Shoal in the Philippines), located north of the Spratlys. Philippine Defense Secretary Voltaire Gazmin told a Congressional budgetary hearing on Tuesday that aerial surveillance of the area had shown the presence of approximately 30 concrete blocks inside the shoal. Gazmin said the photographs, which were taken on August 31, presented a pattern that was similar to the one seen when the PRC built a garrison on Mischief Reef in the late 1990s. 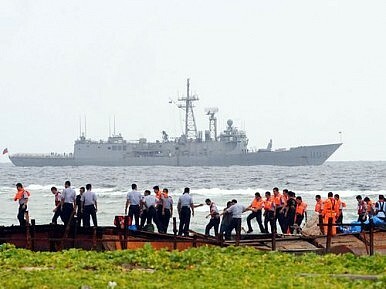 Three Chinese coast guard vessels were also spotted in the area on Aug. 31, Gazmin added. Scarborough/Panatag Shoal was the object of a months-long standoff in 2012, during which China deployed several fishing, coast guard, and warships. Despite repeated appeals by Beijing for Taipei to cooperate with it in defending their claimed interests in the South China Sea, Taiwan has categorically denied it has any intention of doing so. Taiwan controls a prime piece of real estate in the South China Sea. J. Michael Cole on its possible uses.